Thanks to th e amazing efforts of EFry staff and volunteers, our petition to support the rights of vulnerable children (such as those whose parents are homeless, incarcerated or have addictions) who live in less stable home environments has received over 5,000 signatures. The petition calls on the Government of Canada to ensure all children can access the same federally funded benefits, no matter where or how they live in the country. It also asks for children who have experienced homelessness or whose parents are incarcerated or have addictions be recognized as marginalized and appropriately supported to reduce the impact of that trauma. 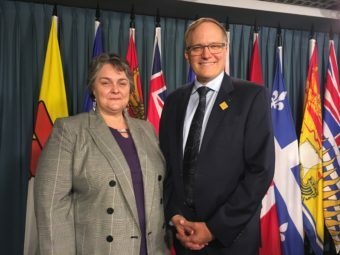 Our local Member of Parliament, Peter Julian, agreed to sponsor the petition and introduced it into the House of Commons in Ottawa on September 18. To watch a video of its introduction (along with other MPs speaking in support), as well as the press conference on Parliament Hill, visit @EFryVancouver on Facebook. Please add your voice & sign the petition! The paper petition remains more influential – every 25 signatures means an MP can advocate for it for a minute in the House of Commons – so please sign it if you can. It makes a real difference in Ottawa. As it’s not possible for everyone to sign the paper version, a Parliamentary e-petition was launched on September 18 and will stay active until January 15, 2019. It only takes a moment to sign, please do so by clicking here. We need your help. Please share our posts on Facebook and Twitter, so we can reach as many people as possible with the petition. Every signature sends the message that Canadians care about vulnerable kids’ rights to the decision-makers with the power to make changes that will benefit many of our poorest children right across the country. 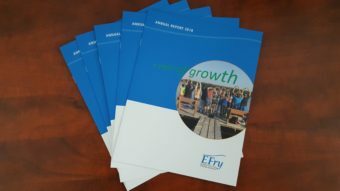 EFry’s 2018 Annual Report is now available. Download it online at elizabethfry.com/news/ or contact us at 604-520-1166 to have a hard copy mailed to you. Everyone can use a little pampering. EFry’s Maida Duncan Drop-in Centre recently held a spa day event for our clients. 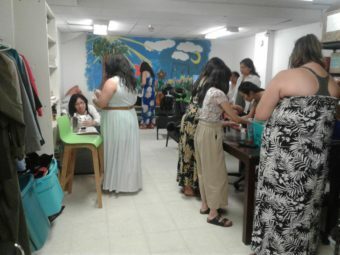 Eighteen women were provided with a range of treatments including back and neck massages, manicures and pedicures, and facials. Eleven volunteers from a local church participated in the event and also provided sandwiches and healthy snacks. The ladies enjoyed having the opportunity to relax, indulge in self-care, and chat with the volunteers. Women who visit EFry’s Drop-in Centre are homeless or living in poverty, which can lead to isolation as they contend with their day-to-day-struggles. Activities like this provide the rare opportunity to take care of themselves, interact with other women on a social level, and be treated with dignity and respect which helps to improve emotional wellness. As part of our ongoing research project with the University of British Columbia to look at the effectiveness of EFry’s Growing Great Kids (GGK) child development and parenting program, we have hired five Peer Support Workers. These women have successfully graduated from GGK and, with help from the course, have managed to find stability in their lives. Having been through similar experiences, they are uniquely suited to provide support and motivation to clients currently completing GGK. 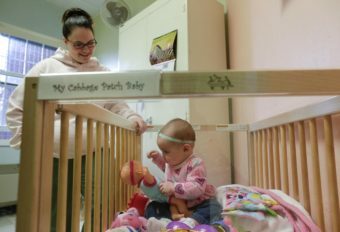 The Peer Support Workers will both support mothers currently in the GGK program as well as support the research study into the program’s impact. Many of the women participating in GGK are interested in careers in social work. The Peer Support Worker roles provide job training, income, and real-world work experience that will help them to build their future careers. EFry’s new Peer Support Worker team is excited to share their insights and experience with new and expectant mothers. Do you or someone you know love to knit? Woolwerx, EFry’s new social enterprise that provides training and employment to women in and exiting prison, has launched its website and Etsy shop at www.woolwerx.com. 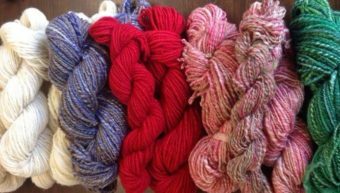 By buying our locally-sourced, hand-crafted batts and yarn online, you will enjoy unique, artisanal wools while making a positive difference in the lives of marginalized women in our community.